The Senate committees with the whitest Democratic staffs are also some of the chamber’s most powerful. Appropriations, Finance and Armed Services are three of the four least diverse panels, according to a Roll Call analysis of data released by the Senate Democrats. Just 5 percent, 6 percent and 13 percent of their respective staffs are non-Caucasian. The Senate Agriculture Committee reported having no nonwhite Democratic staffers, rounding out the bottom four. The data comes through the Diversity Initiative of the Senate Democratic Conference, which began releasing the figures in 2017. Last year, Senate Appropriations’ Democratic staff was the least diverse, at 5 percent nonwhite. Agriculture and Banking were also near the bottom. Democrats on the Banking Committee have improved their diversity numbers since last year — moving from 92 percent white staffers to 83 percent. Republicans — and the committees’ majority staffs — have not published similar statistics for their conference. The release of such data by the Senate Democrats is considered a breakthrough in Congress because there is no rule requiring offices to provide information on the racial and ethnic makeup of their staffs for the public record. GOP representatives for the Appropriations, Finance, Armed Services and Agriculture panels did not respond to requests for data about their staffs. 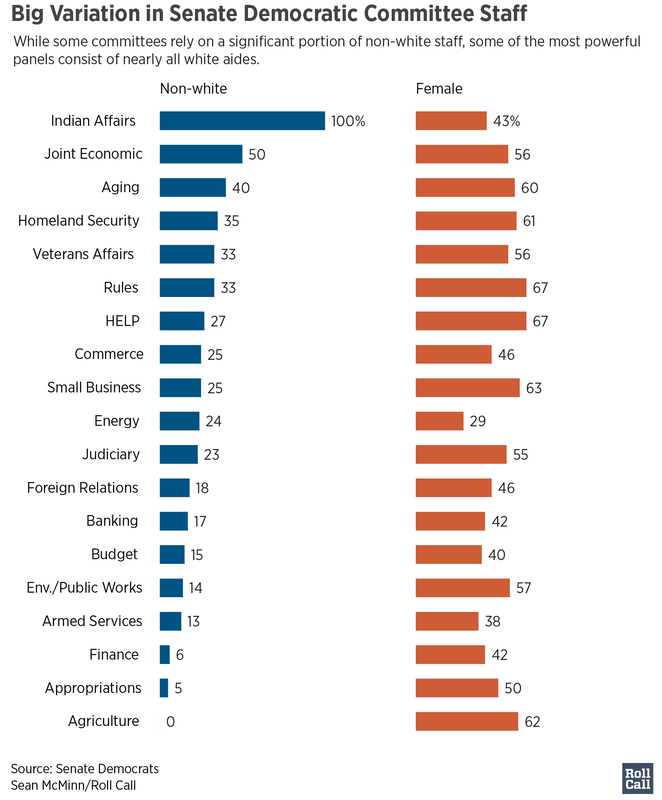 At the other end of the Democrats’ panel diversity rankings, Indian Affairs took the top spot for the second straight year. The staff is entirely nonwhite. The second-most diverse Democratic staff is found on the Joint Economic Committee, which is half white. The Senate Aging Committee comes in third. The Health, Education, Labor and Pensions Committee and the Rules and Administration Committee are tied for the highest proportion of women, who make up 67 percent of their Democratic staffs. Both panels have female ranking Democrats — Washington Sen. Patty Murray on HELP and Minnesota Sen. Amy Klobuchar on Rules. The Democratic staff of the Energy and Natural Resources Committee has the smallest proportion of women at 29 percent, despite the panel having a female ranking member in Washington Sen. Maria Cantwell. The committee also dropped significantly from last year, when women made up 64 percent of Democratic staffers. Armed Services is another male-heavy committee, with women at just 38 percent. All other committees are at least 40 percent female. Staffers of Middle Eastern and North African origin, who are counted in one category, are the least represented on the Democratic side. Seventeen of the 20 committees are without someone from that group. That mirrors the situation in the Senate Democrats’ personal offices. Native Americans, Native Hawaiians and Alaska Natives — also counted in one category — are a close second. Sixteen committees don’t have anyone who identifies as such on their Democratic staffs.